Americans spend more on drugs than people in any other country. 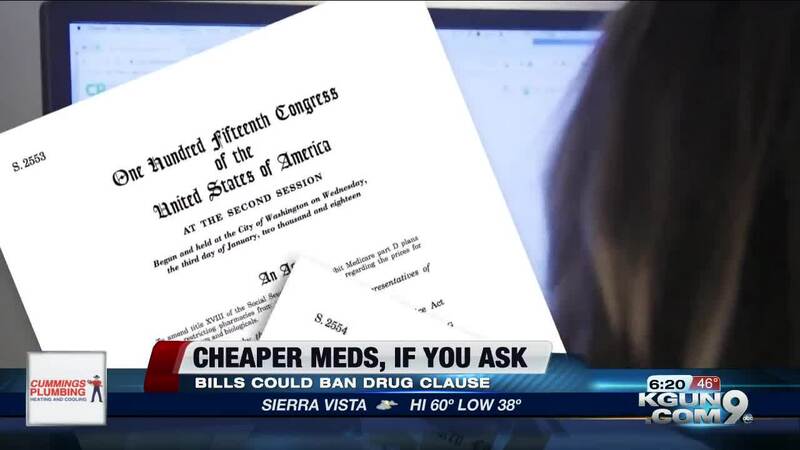 Now, two new bills banning drug gag clauses can help reduce the cost. Consumer Reports has the way to save for cheaper meds, and all you have to do is ask. TUCSON, Ariz. - A March 2018 study found that for about one out of five prescriptions, insurers required people to pay more using their insurance than if they paid the pharmacy's retail price. One reason this happened: Gag clauses. The clauses prevented pharmacists from telling you there may be a lower price by not using your insurance. But not anymore! "Gag clauses were something consumer reports surfaced years ago," says Consumer Reports Health Editor, Lisa Gill. "We worked with a lot of state legislators to help pass state by state laws to help curtail this practice. And then, this past October, two bills were passed in Congress put an end to this practice once and for all on a national level, which is a terrific win for consumers." "We can actually help the consumer a whole lot more," says pharmacist, William Stroud. "For example, last night, a lady came in for an antibiotic ointment, we filled it, ran it through her insurance…was 192-dollars. Put it through for the cash price and it was just $15. So, all that saving went into her own pocket." The number one thing to do, ask: 'Is this the lowest possible price on my medication?' There are some other ways to be money smart with meds and Consumer Reports Health Editor Lisa Gill breaks it down. "Make sure you really need that medication," says Gill. "Two -- make sure you're taking a generic. Generics are a good option for most people and will save you boatloads of money. Third -- Can I get a three-month or 90 day? Save at least one copay, sometimes two." Another way to put the power in your pocketbook: Check out websites that offer coupons.